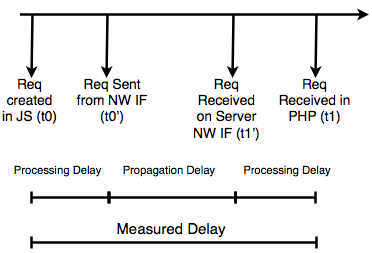 This example illustrates the use of XMLHttpRequest as a method to conduct basic performance monitoring. While doing so you will be introduced to the basics in sending XMLHttpRequests and how to setup event handlers for managing on-going requests. 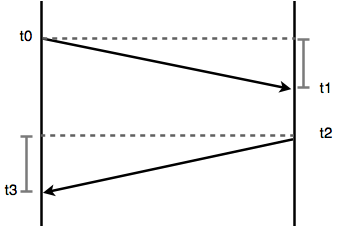 If the clocks of the requester and responder are synchronised, then it would be possible to determine the one-way delay by simply subtracting t1 from t0 to get the delay of the request and t3 from t2 to get the delay of the response. But it cannot be assumed that the time on the requester and the responder are synchronised. The RTT is calculated by t3 minus t0, but you can also remove the time spent on the server by subtracting t2 minus t1. It takes two input parameters: the URI of the responder (this PHP script that will process the request and generate a response) and the method used to send the request. The method can either be GET or POST. Lines 14-17 create a set of event listeners to handle load, error, abort and timeout events. A timeout is set to manage long response times, e.g. if you are not interested in messages that arrive after 500 ms, then you can set the timeout to that value. Note, not all browsers seem to support the timeout event. At least Firefox and Chrome support it. The following clauses handle the different methods, GET and POST. The GET method sends the request data in the URI, whereas the POST method creates a FormData object to store the t0 timestamp and message id. Put this code on the server running PHP. This code will respond to the PM request messages. This script is fairly simple and it’s primary purpose is to create the t1 and t2 timestamps. The function microtime() needs to be used to get millisecond accuracy. As you can see, the response is uses the JSON format. When the requester received the response the load event will be triggered call the function transferComplete. The basic idea is to create t3 timestamp, parse the JSON data in the response, calculate the time spent on the server, then calculate the RTT. In this example, the result is stored in a global variable. You may want to do some input validation of the parsed JSON data and handle the result as suites your needs. HTML file to initiate request messages. PHP file to handle request messages and send a response.